Inciting A Riot: Happy & Blessed Everything! Just a quick note today: Happy Father's Day (belated) from yesterday and Happy & Blessed Midsummer/Summer Solstice to all of you Rioters out there! The Riot is going to be on a kind of hiatus this week. My family is arriving later today, and they will be here until Friday. I will be spending that time rejuvenating, enjoying my loved ones, and getting back to a sense of self and peace I haven't had in a while. May you be supremely blessed. 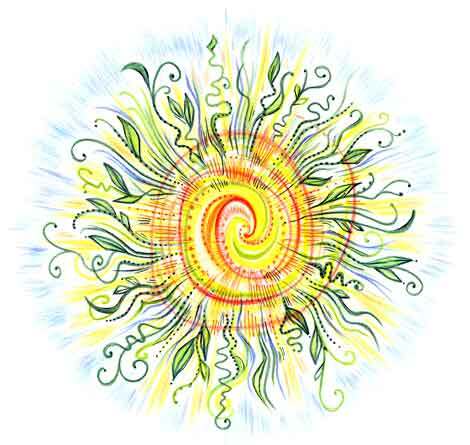 May you get in tune with the energies of Midsummer, and allow the sun to shine through you at this turning of the Wheel. On Twitter today, one of the top trending topics in the ENTIRE FRIGGIN WORLD is 'Summer Solstice.' That means millions of people around the world are talking about this spiritual holy day. What's most interesting about this, for me, is that this is in direct contrast to those out there claiming there is no such thing as the 'pagan community.' There are millions of us in every color, every tongue, every creed, every ideology, and every physical difference there is...and yet we are there. We thrive. So let this advent of technology remind us that we are drops in a pagan ocean, in a spiritual sea that covers the globe. We are united in being children of the Goddess. Until then, Rioters, I will be here. Email me your questions, comments, gripes, or complaints, and I will see you after my tiny vacation! I hope you enjoy it and have a jolly, old time! Enjoy your time with the folks and embrace you're little vacation. Goddess knows you deserve it after being such a super dooper podcaster and friend. Have a spectacular time with your parents!